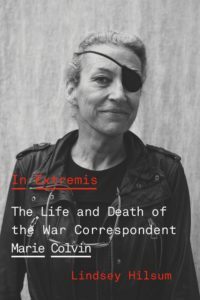 Main image: Marie Colvin photographed in Amman, Jordan, in 1991. Photo: Simon Townsley/The Sunday Times/Courtesy of Farrar Straus & Giroux Publishing. I befriended Mary in the mid eighties, when I was the Le Monde correspondent in Jerusalem. I cannot say we were close friends, but I admire her as a journalist and I have great souvenirs of drinks and dinners with Patrick and Mary at that time. I feel deeply moved by your piece which fits perfectly well with my memories of Mary. Because of your fine words, she is back, with all her dedication to the job, her great looks, sense of humour and humility as well. For sure, she was fearless on the ground and, yes, probably insecure inside. Thank you for this wonderful article and I will read Hilsum’s book.